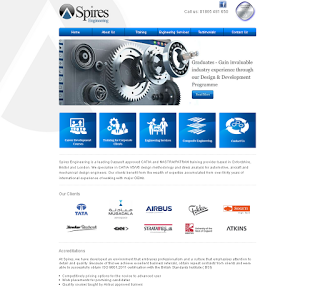 This week’s Website is our Website for the Month of November and it goes to the professional and informative website of Spires Engineering. The website makes nice use of its Pro-Pack with topic-relevant, custom headers-per-page and drop-down menus to organise its training information. As the client has been let down in the past by other web design companies, the whole team at Toolkit worked hard to prove that building a website can be a rewarding experience and that for us, the client was worth working hard for. The website is a great example of the Customer Support that we are well known for and that we are proud of. Spires Engineering is a leading Dassault approved CATIA and NASTRA/PATRAN training provider based in Oxfordshire, Bristol and London. They specialise in CATIA V5/V6 design methodology and stress analysis for automotive, aircraft and mechanical design engineers. Their clients benefit from the wealth of expertise accumulated from over thirty years of international experience of working with major OEMs. You’ll notice the overall look and feel of this website is very smart and well-dressed. The background of the website features a subtle, watermarked version of the client’s logo. This, combined with the polished and professional looking blue buttons with a neat hover-over-effect at the top of major pages, really make the most of the custom page dressing that has been applied and the matching icons and page separators that have been used. Spires Engineering also chose to go with our Pro-Pack, which gives them the added options of having different headings on every page as well as having dynamic drop down menus under any menu item. Having custom headers per page is a great idea. It adds variety to the website user’s browsing experience and gives the page more visual impact as the image can be made to individually suit the content. The client also has the ability to update these going forward in The Toolkit resulting in an easy way to refresh the look of their website at any time going forward. Spires Engineering was very happy with the build process as well as the finished product, stating that we demonstrated “frequent contact and friendly service” before giving us 4 stars overall. To read more about why great Customer Service is so important to us, read our past blog post here. Find out more about Toolkit Websites, Web Designer in Southampton, Hampshire, UK and how they can help your business grow.